Everyone would like to fix the US energy policy, but doing so is almost impossible, in my view, because we need to be planning for a much bigger change than most people can even imagine. It seems to me that our international financial system is at this point, inching closer and closer to collapse. It needs growth to operate. Now that world oil supplies are virtually flat, and China and India and oil exporters are getting more of the oil, the financial system can’t get enough growth momentum. The US has applied various sleight of hand techniques to try to cover this problem (see my post What’s Behind US Budget Problems? ), but at some time in the not too distant future, the techniques are going to stop working, and there is going to be a major financial crash, with debt defaults. This could happen when QE2 ends, or maybe QE3, QE4, or QE5. The timing may vary by country, with some countries holding out for a while longer. 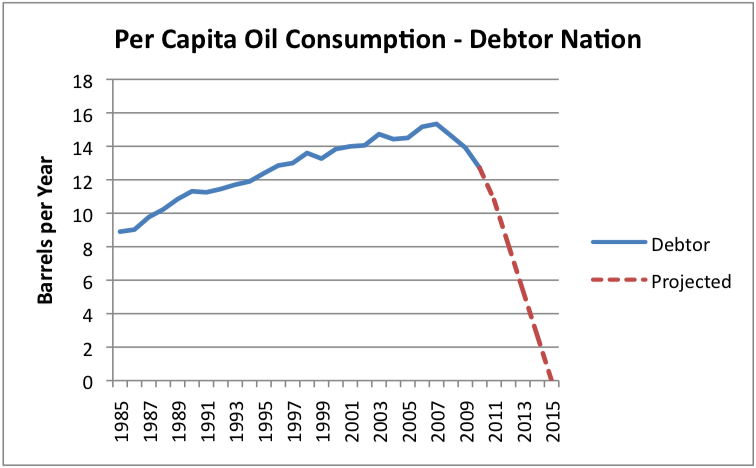 The point is that the oil consumption goes down very quickly, not over a period of many years, because the decline in supply is determined by something quite different from what oil is in the ground–it is determined by ability to pay for the oil. A potential buyer can be cut off very quickly, if its credit is no good. We have gotten used to the idea of being able to keep running a tab, but at some point, this whole process is likely to come to a halt–something that can’t go on forever, won’t. Some international trade may continue, especially when a country has goods to trade for oil (rather than an IOU), but the level of free trade we have now can’t be expected to continue indefinitely. The problem I see with a collapse scenario is that a plan that uses less oil and tries to make it go farther really isn’t helpful. Thus, a gas tax, or cap-and-trade, or fuel-efficient cars, or more fossil fuel extenders like wind and solar PV really aren’t helpful. Instead, we need to put our effort into figuring out how we would get along without fossil fuels and nuclear, rather than get along with less. We may have some supply for a while, but if we do, we need to use it to help with the transition, not to expect such supply to continue forever. This is the big problem I have with energy policies and transition plans–they assume we are planning for a slow decline, when it is likely that we will not have such a decline. Everyone would like to add new and more complex systems to help–for example, more wind with upgraded transmission systems, smart grids, and electric cars. As nice as these might seem, the new systems become more and more complex, and more dependent on everything working together exactly correctly. As we lose ability to import spare parts, they will become very difficult to maintain, and will likely collapse within a few years. While they seem appealing, I don’t think they will add very much for very long. 2. More even distribution of incomes. With much less wealth, it won’t make sense for a few to have such a disproportionate share. Changes such as these would be very difficult to make within our current structure. But without making such changes as well, it is hard to see that the new system would work. This entry was posted in Gail Tverberg, Oil Shocks. Bookmark the permalink.